The little town Skud in the Province of Katingen is situated by two rivers, the Betova and Luva Rivers, near the German-Latvian border. The Betova River divides the town into two, with a connecting bridge. One section was known as the Old Town and the second as the New Town. The New Town was the wealthier of the two and considered the elite section of Skud. A few Jews settled in Skud in the 17th Century, and their numbers increased in the New Town through the 18th Century and 19th Century. In 1766 they numbered 576 souls, but in 1847 there were 1872 people, and in 1897 the (i.e. 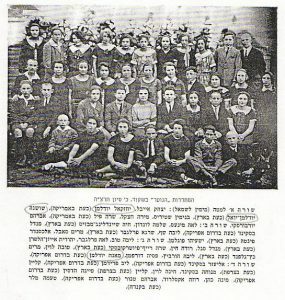 the Jewish) population rose to 2292. In 1921 they had increased to 3853 and by 1939 the Jewish population was 2500. This was 50% of the total population. Drubyan, Katingen, Memel Maised, Yolak, Salant, Bershtits and Flutil were towns near Skud. 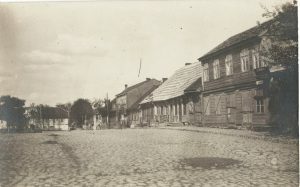 The Old Town had one long road called the Jewish Street and this differed from the New Town in that there were Poles, Russians and Lithuanians living there. From the Jewish Street ran two narrow Paths – one leading to the Old Shull and Chedar, (* over the wooden bridge) the other was called the Mikvah Path. This Path led to the Betuva River where the Jewish population swam in summer. Skud was very small and constructed in a special way. From both sides of the Jewish Road were two tunnels where water accumulated after the rains. Between the one tunnel and the houses was an empty stand. This became muddy and water logged when it started raining. To visit friends on the other side of the road, one had to go around the muddy stand, which resembled a pond at that time. With time, many shops moved to the New Town and the population increased substantially. The market was circular. In the middle of this circle were two rows of wooden shops. From the Market Circle a few roads extended outwards. One of the roads led to the Old Town. The Milk Path led to the Lithuanian Dairy. Maised Street led to Maised. The path leading to the Primary School and abattoirs was called the Rabbi Path, the Yolak Road led to Yolak and the Long Road to the Latvian border. The Priest Road led to the Christian Church and the Bioscope Road led to the bioscope. Every Monday and Thursday was Market Day. The farmers sold their produce to the inhabitants. Three or four times a year a Big Market was held when horses and cows were sold. A day before the Big Market long lines of camps formed going in the direction of the town. All businessmen and vendors displayed their wares. Unruly behaviour sometimes occurred and the Jews were very thankful when no incidents occurred. They feared especially Erev Pesach when the Old Blood Libel was directed against them and riots took place. Skud was noted for its culture, hospitality and social services. People’s love for Israel, their warmth and friendliness was remarkable. On a Friday evening members often brought home guests from Shul. No stranger was allowed to spend Shabbat alone and friendless. In Skud there were some big wholesale Grocers among them Fogelman and Bros. where building materials were sold (Rose Mansfeld’s father – one son married to Hasse Merre Chin (inserted by Y. Chin). People from other towns came to shop in Skud. The shoe industry was the main industry of the town. A large group of Youths worked there. They specialised in the stitching of shoes. Most of these factories had new electric machines. The shoe producers * in the New Town were Itschak Cohen, Michael Mintz, Hirsch Gilder, Shlomo Peres, Yehuda Berman and Bernstein and in the Old Town Abromowitz, Moische Yankelowitz and Moische Leib Greenblatt. In all, the factories produced a total of 400 pairs of shoes per day. ant day. The odours of freshly baked Kitkes, and delicious Jewish dishes filled the town. The workers and children had tasted the fresh rolls baked by the women in honour of Shabbat as early as Friday. There was a hustle and bustle in the butcheries and fisheries. Business was brisk. Preparations and spring cleaning for Shabbat was in full swing on Friday. The bath, haircut and cleaning of shoes were all activities much in evidence for the great occasion. one could afford. All ate like Kings and welcomed Queen Shabbat. The candle light bathed the Jewish homes and sparkled in the darkness with happiness. The singing of the “Shabbat Nigun” added lustre to the special grace that was Shabbat. Shabbat was felt in every corner of Skud. In the morning the Shabbat solemn silence was * tangible in its own special way. Those who prayed in the Old Shul in the Old part of town came very early for morning prayers, whereas in the New Town the prayers were * longer. After the “Tsolent” there reigned a special solemn silence in town – the special atmosphere of Shabbat sleep in the afternoon. The youth were busy with cultural activities in the clubs mostly situated in the school building. They would go hiking in nearby surrounding woods. The spirit of Shabbat was everywhere. The Gentiles had to prepare beforehand because during Shabbat nothing was available. On the 22nd June 1941 the inhabitants got up as usual and no one could foretell the terrible tragedy that was to come. In the afternoon a rumour spread regarding a terrible battle that started between Russia and Nazi Germany. The Germans had crossed the border in Buren and had already penetrated the city of Kartingen and were moving towards Drubyan. A feeling of terror spread amongst the Jewish population in Skud. Some packed their few belongings and left their birth place and fled to unknown destinations hoping to find a safe haven. Others believed that no serious danger was imminent. At worst, they would have to work for Hitler. Meantime, the Red Army that had been stationed in town advanced to Latvia (the border of which is 2 km from Skud). The Lithuanians rejoiced and couldn’t wait for the moment they would be freed from the Russian yolk. They could then slate their blood lust in innocent Jewish blood. This latter unfortunately came to pass. That very same day, 22nd June at 2:30 pm, the Nazi hordes penetrated Skud. 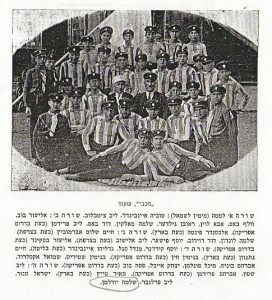 The Lithuanians, ‘The good friends’ of the Jews of Skud, who only a day before had earned their living from the Jewish population received the Nazis with flowers and cheers of welcome. They flew national flags from their roof-tops. (After a while they were forced to remove them.) Subsequently they executed all tasks assigned to them. In derision they pointed out any Jewish passer-by. The occupation Force numbered only one hundred men under their commander. The rest of the German Army moved on towards Furkulin and Lavoi in Latvia. For the twenty-hours following the invasion, the Nazi military supplies passed through Skud to new battle grounds. The next day a command was issued that forbad anyone of the local population possessing arms. A final date was given when all pistols etc., had to be handed in. The command also stated that for every German injured or killed, one hundred Jewish lives would be forfeited. Despite this, many Jews returned to Skud albeit deeply distressed. The Jews were immediately given menial, onerous, bogus tasks. It was most distressing when a young whipper-snapper, who just days before had sat next to Jewish students, tormented them the most. The Germans were added and abetted by the Lithuanians, when they attacked women and children and plundered wherever they went. In the meantime the soldiers of the Red Army, who hid in the surrounding forests around Skud, regrouped and decided to attack the Germans and recapture Skud they heard that the occupying Nazi force was small and although they were outnumbered by the Nazi invaders, in the evening of Saturday the 28th June they returned to Skud. A bitter battle raged in the middle of the New Town between the Nazis and the Red Army. The Germans used hand grenades. * Fires started in the Market Place in the Long Street, the Yaluka Street and Miseid Street. Soon, the whole New Town was aflame. Heavy losses on both sides resulted. The German Commander was killed. On Sunday morning the Germans got re-enforcements and the Red Army that had fought so courageously had to surrender. When the battle ceased there was a large number of civilian casualties and also a few Jewish casualties amongst them the Rabbi of Skud, Rabbi Terushkin, who was killed in Meised Street. On the same Sunday the fate of the Jewish population was sealed. 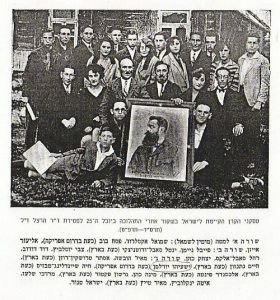 The German Authorities falsely accused the Jews of giving information to the Red Army in the forests, regarding the small contingent of the Occupation Forces. The blood thirsty got their desire. The Command was given. 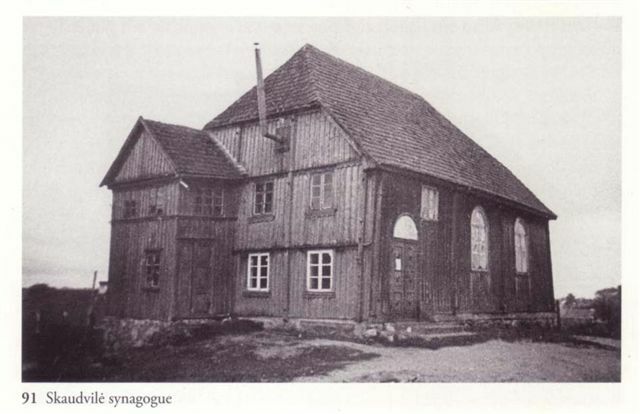 All the Jewish men were herded like animals into warehouses, one being Shoulistim Hall while the women and children were sent to the big Shul in the Old Town (later the Germans desecrated the Shul by storing cattle fodder in it). On the 29th June the Jewish Skud Community tragically, ceased to exist. 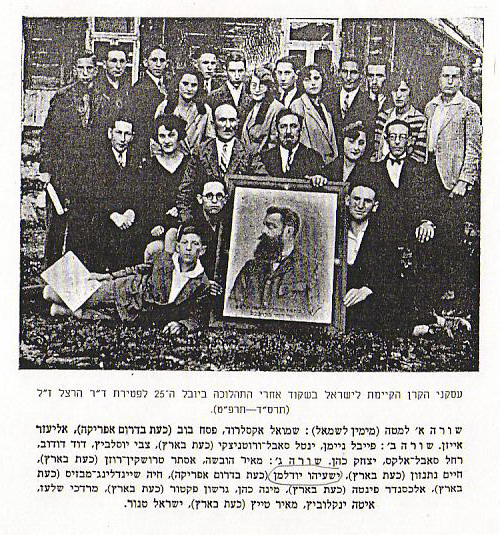 In the evening a group of men were brought to the field of Zelikowitz – a short distance from the warehouses. They were ordered to dig two large trenches/mass graves. When this was completed, groups of fifty men were brought there and shot on the spot. The whole night drunken Lithuanians brought on German Command, Jews to be shot. The poor Jews were savagely and brutally manhandled before they were shot. The Lithuanians acted like wild animals. Itschak Malkinson, who had recently bought those same fields where the Jews were shot, attacked one of his tormentors and throttled him with his own hands, before a German bullet killed him. While the avenged Jew was killed, the Lithuanian atoned not only with his own blood but the blood of the whole community. Honour to his Memory! At the end of this horror, the Germans left four Jews to clean up the Jewish houses in the Old Town and prepare them for the German occupation. These houses were not damaged from the battle. These four Jews were Ruvein Gilden, Moische Leib Greenblat, Natanial Turk and Joseif Ben Rabbi Yehuda Levine. They too shared the same fate as their brothers. The head of the Lithuanian Mob was Petrus Birlens, a Barber from the Old Town. Petrus who grew up with the Jewish Youth, was fluent in Yiddish. He had a lot of Jewish clients and was often entertained in Jewish homes. At 29 years old he realized his dream: he dipped his hands in Jewish blood. Cursed be his memory! The women and children were incarcerated the whole week in the Old Shul. They suffered deprivation, hunger and torture. After one week all the women, young, old, healthy and sick, some pregnant, some with babies in arms were herded together and told to walk to Drubyan. Lithuanians encircled them and anyone not able to keep up was shot on the spot. The Lithuanians claimed that these were their orders. 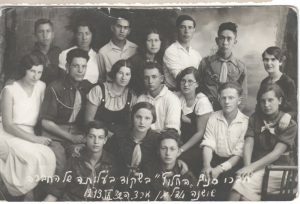 The women who had been in the Shul were brought to Dimitrovas Farm between Drubyan and Katingen, a place which was used earlier by Communists from surrounding areas for Administration purposes. The Skudder women worked as agricultural hands under terrible conditions. Inhuman treatment was metered out to them. Ultimately, their fate was no different from their husbands and families. 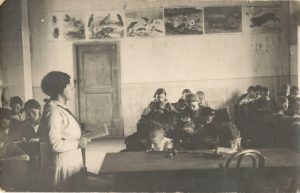 In Autumn that year the innocent Skudder women and children were also shot by Germans who came to Talzash Province. Honour to their memory! 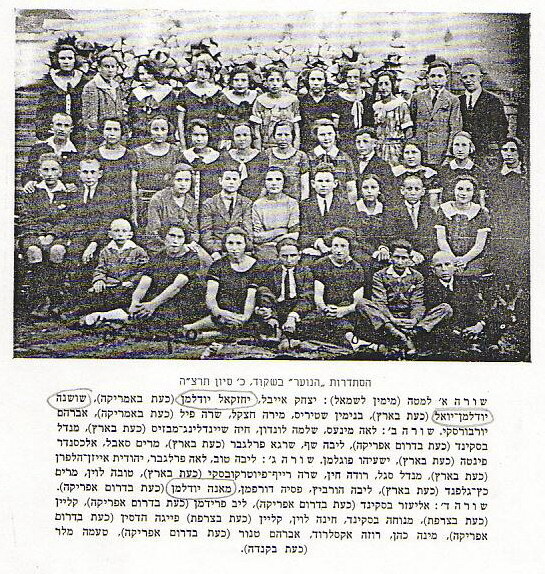 Jewish blood soaked the town – our town, Skud, was tragically wiped out.